I stalk you and all the other visitors to TSR, with Google Analytics. This is how I find out which trading articles and strategies you enjoy. Then, I use this information to help me produce more solid content on active technical trading. TSR’s web analytics reveals the content that our readers enjoy most, as listed below. This is not a list of articles with the highest number of page views. This is a list of articles with the most returning and engaged visitors. Here are the 7 trading articles/strategies that people read once, twice, again and again. Find out why. New traders gravitate towards price patterns and think of them as money-making signals. Pin Bars will make you rich, or not. They do not realize that price pattern is just one facet of a trading strategy. 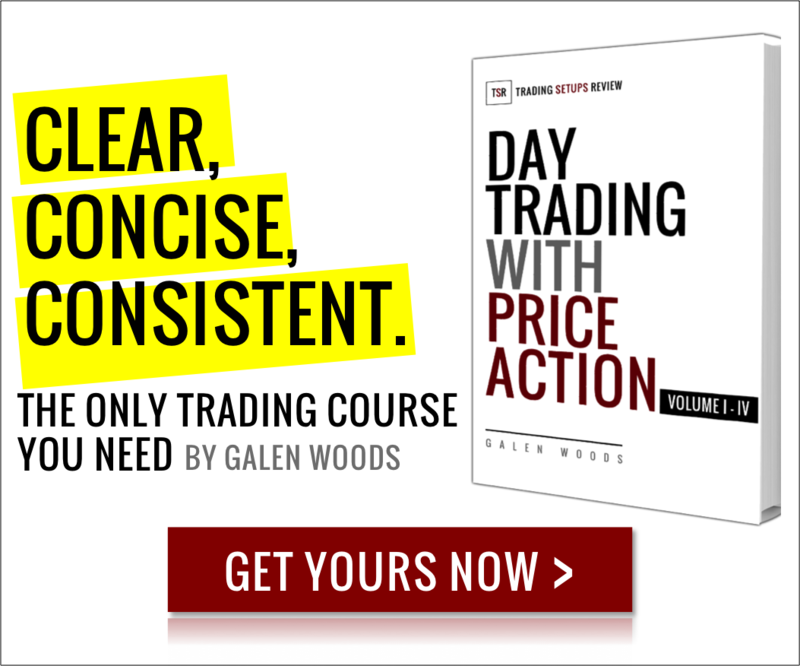 Get to know all the components of a price-based trading strategy. Have you ever felt trapped by the market in a losing position? Eventually, you lost, and someone else must have won. Why not reverse your role and be the winner? Trapped traders form a fascinating topic for price action traders. It is a great approach to understanding price action setups. Once you can pinpoint trapped traders on a chart, you will also find the perfect entry. The market moves as a result of demand and supply. If you agree, it’s not hard to see that the concept of support and resistance is useful. A support level is where demand tends to overwhelm supply. Hence, price tends to stay above a support zone. A resistance level is where supply tends to exceed demand. Thus, price tends to stay below a resistance zone. Need help to trail your stop-loss orders? Need help to set a trade target? Use support and resistance zones. 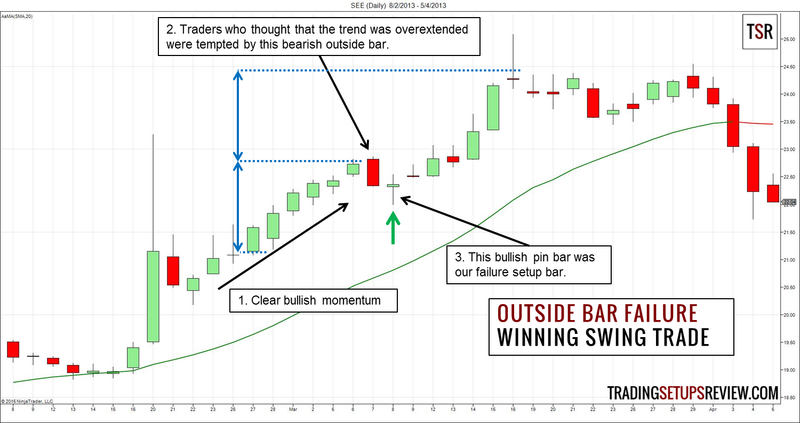 Outside bars are tricky to interpret because they show strength in both directions. Both bullish and bearish traders are excited. Everyone is paying attention. Hence, when a bullish outside bar stalls unexpectedly, the market tone becomes bearish. 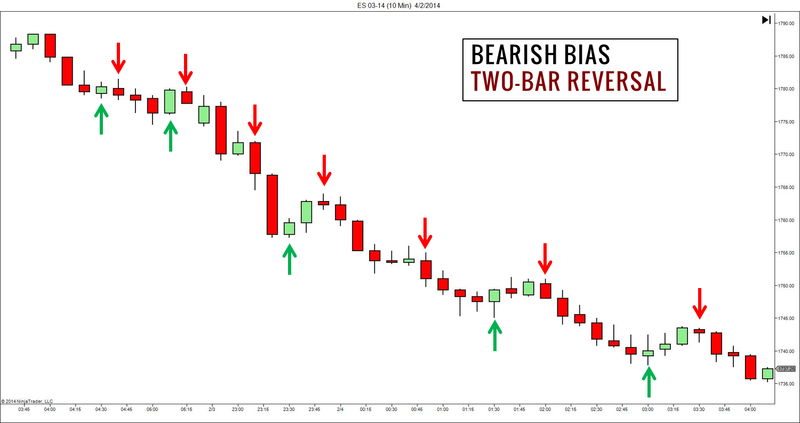 (The reverse applies when a bearish outside bar fails.) This is the basis of this failure setup. You can use this setup for day trading as well. But this review focuses on swing trading examples. If you are new to price action, you need to read this step-by-step guide. This is not a guide to candlesticks, bar patterns, or chart formations. It is a simple generic method that studies the relationship among price bars. The Holy Grail is an elegant setup by Linda Bradford Raschke. It is the one of the first setup I reviewed on TSR when it was still hosted on Blogspot. And it remains one of the most popular setup on TSR. While it is not the Holy Grail, traders appreciate its sound basis. Using the ADX indicator and a moving average, it finds retracements in powerful trends. The big picture is crucial. It keeps us on the right side of the market wave. Using multiple time-frames is an effective method to factor in the larger picture. With multiple time-frames, it’s easy to complicate things. This is why in this strategy review, we use only one indicator on both time-frames. If you missed any of these articles, you can read them now and tell me what you think.